Less than two months before Monday’s escape of three prisoners from the East Coast Demerara-based Lusignan Prison, the Private Sector Commission had warned Public Security Minister, Khemraj Ramjattan about the inhumane conditions at that penitentiary and security risks being posed to prison guards. 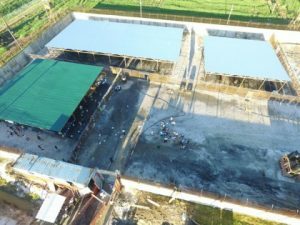 “While the Commission is concerned about the safety and security of the public, it is also disturbed by the less than humane conditions under which the prison population at the Lusignan Prison is housed. These prisoners are made to sleep under sheds in the open, posing health risks to the prisoners and a danger to the wardens. We are of the opinion that these conditions could also have an impact upon the country’s Human Rights ranking,” the PSC told the Minister in a letter dated August 28, 2018. On Monday morning, three prisoners scaled the wall of the Holding Bay at the Lusignan Prison and escaped. In the letter seen by Demerara Waves Online News, the apex business organisation said it was “increasingly concerned” about prisons security and called on government to address a number of issues “with utmost urgency” concerns discussed at a recent meeting of the Prisons Management Board. The PSC said issues include a general lack of adequate security at all of the prisons, a lack of fire prevention systems, the lack of transportation facilities to enable movement of prisoners and food, where necessary, and the inadequacy of the current complement of prisons to safely house the prison population. In the area of security, the PSC said there was a “clear and present danger to the prison warders and the public at large”, lack of fire prevention systems at the mostly wooden colonial era prisons. As far back as 2002, a female prison guard was shot and paralysed for life when five prisoners escaped from the Georgetown Prison. One prison guard was killed and several others injured while efforts had been made to quell a fiery unrest in July, 2017. “The Private Sector Commission is concerned that, after two devastating prison fires, resulting in loss of lives and the escape of dangerous criminals, enough is not being done to prevent further fires,” the PSC said in its letter signed by the chairman of its governance and security sub-committee, Gerry Gouveia. In March 2016, 17 prisoners were killed in a fire at the Georgetown Prison and in July, 2018 all of the wooden prison buildings at that location were destroyed by the fire. No one was killed. “Minister, the Private Sector Commission believes that the vexed question of internal security is one that is hampering investor confidence and one that must be prioritised by our Government. We are, therefore, confident that you will utilise your good office to address this particular aspect of our security,” Gouveia added. The United Nations’ Working Group of Experts on People of African Descent, under the auspcices of the Office of the United Nations Human Rights Commissioner, had in 2017 recommended that the Lusignan Prison be shut down “without delay” and replaced by one that meets international standards. The Working Group visited Lusignan Prison and found that majority of inmates in the prison are Afro-Guyanese. The inmates are kept in appalling conditions not fit for human habitation. The facility is located close to a landfill with foul odour coming from stagnant dirty water. The unhygienic conditions of the prison and associated health risks are of serious concern. Due to its wooden construction, the facility also poses a significant fire hazard. The Working Group found that the Prison clearly fell short of the United Nations Standard Minimum Rules for the Treatment of Prisoners (Nelson Mandela Rules),” the Working Group had found. Dangerous prisoners have in the past escaped from the Lusignan Prison, and most of them have since been recaptured.